Enter your Sign In and Password and click on Login. We request you to keep your password Confidential and not share it with anyone. Sharing of password violates Clause No. 3.5 of Terms and Conditions. Passwords are compulsorily required to be changed by the user every 60 days. The landing page is the subscribers Personalized Home Page. My home pages is divided into 2 frames - Left & Right. The Left Frame contains the Table of Content [TOC], which lists the Databases. Headings may be collapsed or expanded individually by clicking on the + and - icons. The main text/document appears in the Right Frame. Show TOC displays the table of content. Hide TOC collapses the table of content. To have more space for reading the document (on the right frame) hide the TOC. My Preferences — Allows you to set your default preferences for a customized view of searches. You can sort the results by Relevance; Decision Date (Oldest/ Newest); Court Name (A - Z / Z-A); Title (A- Z / Z-A). Edit Profile — Allows you to edit your personal contact details. Change Password — You may change your password any number of times through this link. It is mandatory to change your Bdlex password every 60 days. Dictionary — Compilation of legal words and their meaning including phrases and maxims. Manage Search — Manage Search allows you to edit, review & modify your saved searches. Maxims — Legal maxims guiding principles of law and jurisprudence. Court Calendar — View Court Calendar for Supreme Court of Bangladesh. Feedback — Click on the link to leave your feedback. Your feedback enables us to serve you better. Last Login Information — Displays your last login information. Free Text Search — Word and phrase search interface provides flexibility of Simple, Boolean and Proximity Search. 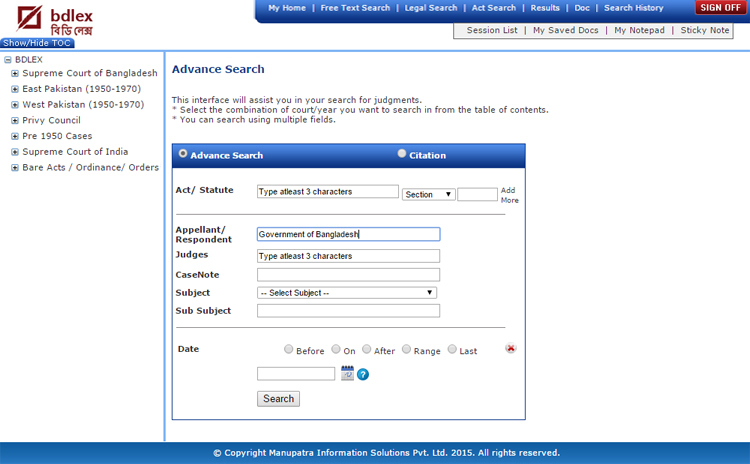 Legal Search — Field Search interface allows you to search for Judgments on Act, Case Note, Appellant/ Respondent/Judge Name, Date Subject, Sub-Subject and Citation. Act Search — Allows you to search in Bare Acts database only. Doc — Takes you to the last document viewed. Search History — Shows the list of last 20 searches done by you. Select from the list and view the search results instead of typing your query again. Session List — is valid only for the duration of current session. Add documents to session list for further action of Email, Print and Save. Once you sign off the session list ceases to exist. My Saved Docs — View the saved documents, these can be saved in different folders. Password security can be enabled on selective folders. My Notepad — To create notes for different documents and add to your list for future viewing. Sticky Note — Add Sticky Note, Highlight and mark text in documents as per personal requirement. Sign Off — To sign off from site, always use the Sign Off button. This interface gives you the single search box experience and assists you to search for key words, phrases, multiple phrases and more. You can perform Boolean searches using Free Text Search. You can type your query and the search engine uses back end algorithms to give results based on relevancy. The results can be sorted on Decision Date; Title; Court Name and Relevancy. Near each other search is proximity search. This searches for the query terms within 20 words of each other. User does not need to frame the query, but simply check the near each other box. You have an option to search two acts in combination, by clicking on Add more across the Act text box. Another box will appear where you can type/chose second act to search in combination with the first act. This feature is important as at times provisions of two acts are referred in conjunction to each other in a case. Type at least 3 letters of the second Act name Example : CONSTITUTION OF THE PEOPLES REPUBLIC OF BANGLADESH. 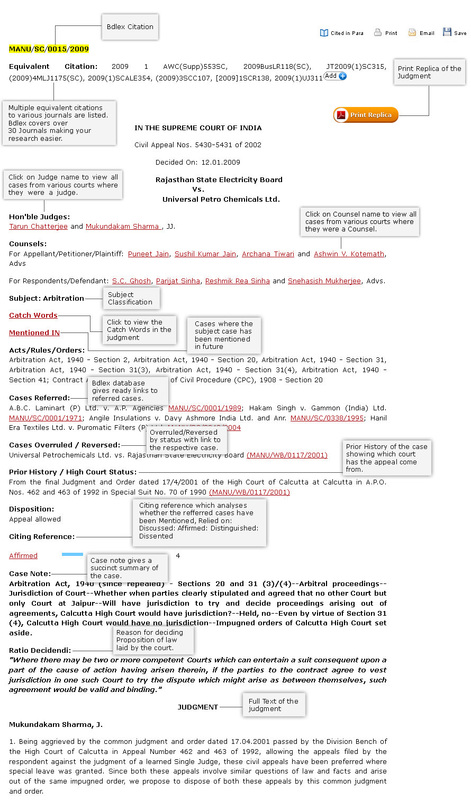 Searching for cases by "Judge Name"
Searching for cases by "Case Note"
Case Note Search allows you to restrict your search only to the Case Note of a judgment instead of the full text of judgment. This search is restricted to those judgments, which have Case Notes. Choose subject from the drop down box – for e.g. we have chosen subject “Arbitration”. Searching for cases by "Date"
Select date option. It can be "Before", "On", "After", "Range"
You can also search on a particular range/period by selecting "Range" option. Enter the Volume No or select volume no from the drop down. The system lists the volume nos. if relevant for the selected publisher and or year. Enter the Page No or select page no from the drop down. The system lists the valid and available page nos. for the selected volume and or year. In case you do not specify all of the above components, your query may yield multiple results that match the components specified. Note: We cover citations for over 30+ publishers. Even though we have taken adequate care to include as many citations as possible, it may happen that the citation you are searching does not give any result. Please search through some other parameter to find the judgment that you are looking for. Following is a typical screen shot of how Search results appear. This gives a quick bird’s eye view on editorial enhancements The user can now read essential fields like Case Note (based on which a user may decide to read the full text), cases referred with appropriate context of reference, equivalent citations etc. To see Manu Instant take the mouse over the results, a blue colour double arrow icon will appear . Click on the icon to see the value adds instantly. To close Manu Instant click on the cross button appearing on the left side of Manu Instant window. One can also take a print of the details as available in the Manu Instant window. This interface helps you to Refine and further narrow down your search. In Search eg. for child custody. User can continue to narrow down the search any number of times. 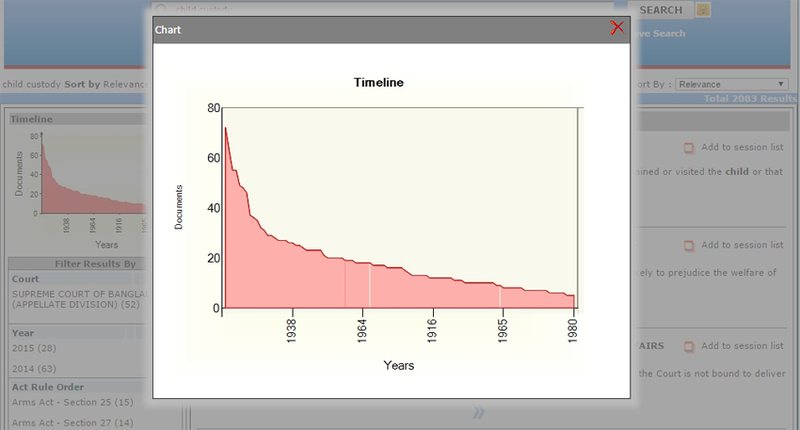 Graphical representation of the occurance of cases in different years. This provides the user a quick information on the number of verdicts passed and as available in Bdlex database in graphical representation. 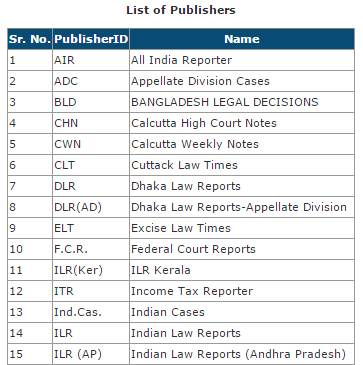 This feature helps the researcher/ user to form a statistical opinion on prevailing prominence of legal issue during a particular year range vis-a-vis verdicts passed by the respective Courts as covered in Bdlex database. 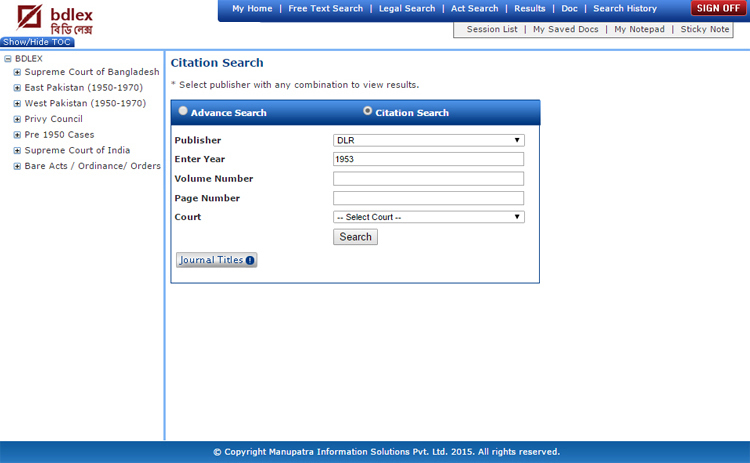 The search results are further filtered / categorized by Bdlex under various heads making navigation easy for the user. The results are filtered / categorised under heads such as Court, Act, Keyword, Subject, Judge, Period etc. In one glance a user can know how the results are slotted across different heads and straight away access the one that is relevant to his research. Keywords are based on taxonomy. The filters display the keywords which are based on the subject of the search results. Save Search — This provides the option of saving your searches for future reference. Click on Save Search. Give the search result a name, “Save search as”, by which you may recognize the search at a future date. The searches are saved on Bdlex servers. For e.g. here we have the saved the search with “child custody” name. To access your saved searches, go to My Home page using the tab in top bar. You can delete or rename the selected search. This Allows you to Add documents for current session. Valid only for current session duration, the session list ceases to exist once you sign off from the current session. Click on the Add to session list link appearing against each document. This helps you to re-search and collate short listed documents for analysing them. The session list appears as follows. You may View the documents by clicking on it, you can also Email, Save and Print the document. In case multiple documents of the session list need to be emailed or saved one can check the action box & then Email or save. Bare Acts / Statutes can be viewed directly from the TOC. Click on the + sign next to the Bare Acts & then click on Table of Contents. The Bare Acts are listed in the right frame under Alphabetical & Chronological, listing for India, Bangladesh & Pakistan. 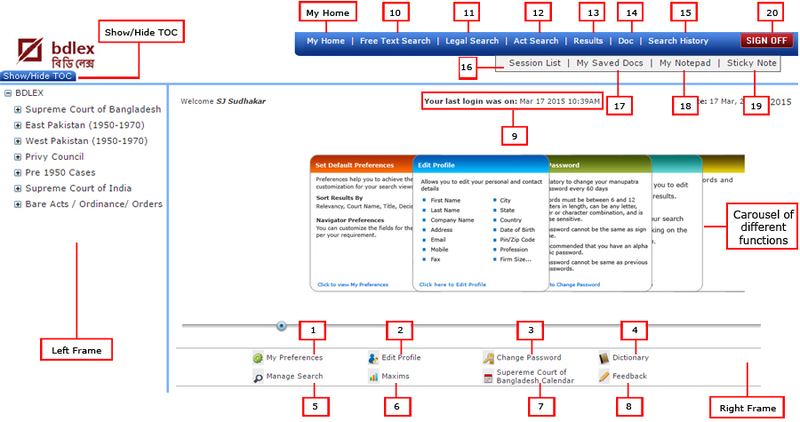 Clicking on Chronological index shows yearwise listing of the Bare Act. One can click on the year to view Acts appearing in that year. Clicking on Alphabetical Index shows Bare Acts listed alphabetically. In the example below we have clicked on Alphabet A. All the acts starting with A are listed. Typing at least 3 characters of the Act name will list the related acts, making the selection easier for you. 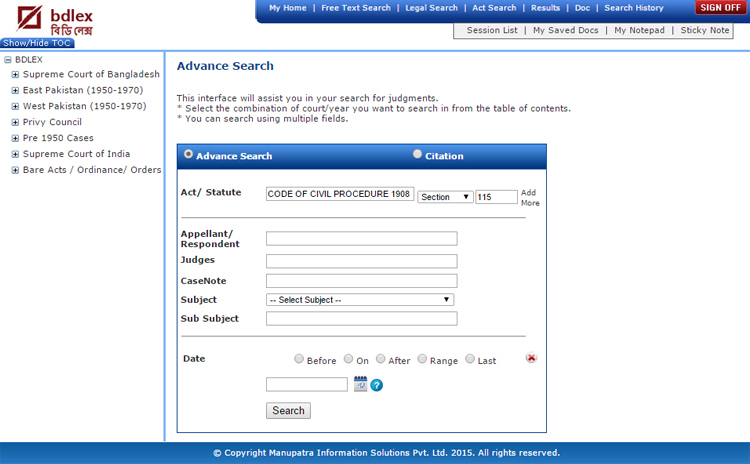 In the Act Search the user has an option to search Section, Order, Article, Schedule etc. In the provision select Section No. 2, click on search. Print Replica are the judgments in PDF format as reported in the journals. These are available for ready download& are accepted in courts. This Icon is displayed at the top right corner of the Judgment. The documents have the icons for Print, Email, Save on the top right corner. 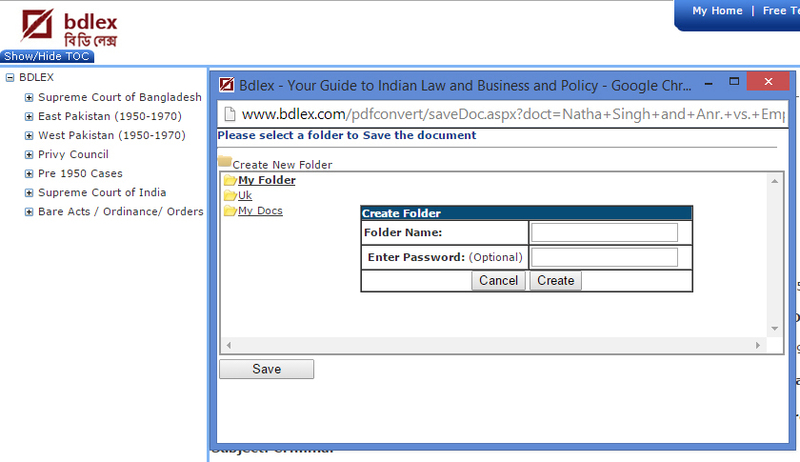 You can Print Document available on Bdlex Database. Click on print icon. A pop-up window will appear giving the different options. 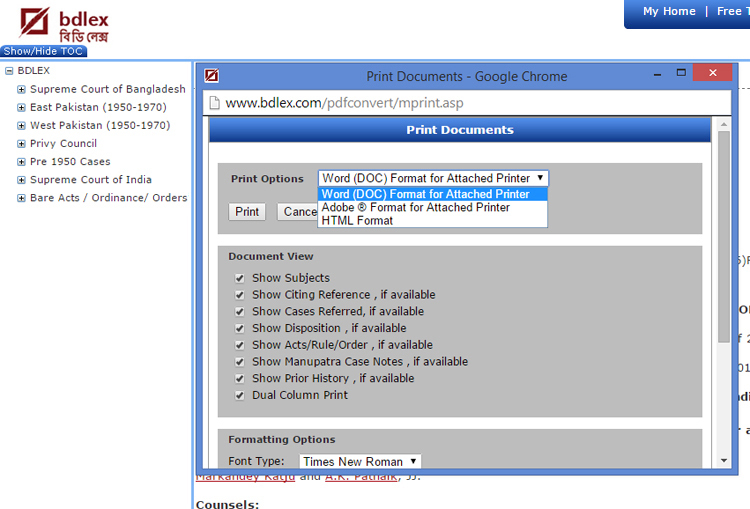 The print option comes with Word, PDF & HTML options and enhanced editing features of selecting Font Size, Font type. Users can also choose to print a particular judgment with/without showing subject, citing reference, case notes, prior history etc. Dual column printing facility is also available. Once you Click on Print it will show you the Print preview as shown. The example below shows the preview of a doc file. You can print the document thereafter. Alternately you may Print from the session list also. Change the recipient email id if required and click Send. Alternately you may Email from the session list also. User can save the Document by clicking “ Save” Icon appearing on the top right corner of the document. You can save the documents in folders. Once you click on Save, a window will appear, showing you My Folder by default. You can create a new folder by clicking on Create New Folder icon. A box will appear asking for the folder name & password protection, which is optional. If you apply the password for a folder, while opening the folder you will be prompted for the password. The folder can be viewed only after password authentication. If you leave the password box blank and create the folder, the folder can be accessed without password. Print, Save, E-mail, Go back to results, Find within Document, Go to top, Go to bottom icons now also appear on right bottom of the page on mouse roll over. Take your cursor to the right bottom of the page for these to appear. No need to scroll to top of the page anymore. Allows you to make notes online while you research. Clicking on My Notepad opens the pop up where user can make personal notes pertaining to a document being viewed or also make generic notes. User can create/invite/share the note against a document. The invitation can only be sent to Bdlex’s existing user. Open a case against which you want to create/invite/share note, Click on My Notepad on the top Menu, and click on “Add to My notepad”. 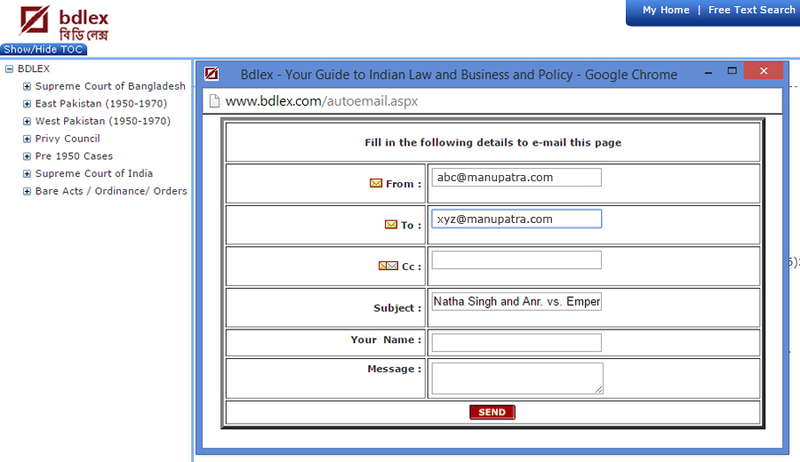 To invite your colleagues (who are using Bdlex) click on “Invite to Share Note” button. An email will be send with the document id against which you want to invite/share note to the users whom you have invited. All the notes written against that document will be displayed along with your note. You can view the note by clicking on the clip icon appearing on the top left of the document as soon as you create a note or you can also see if someone has invited you to share the note. You can also search within note. 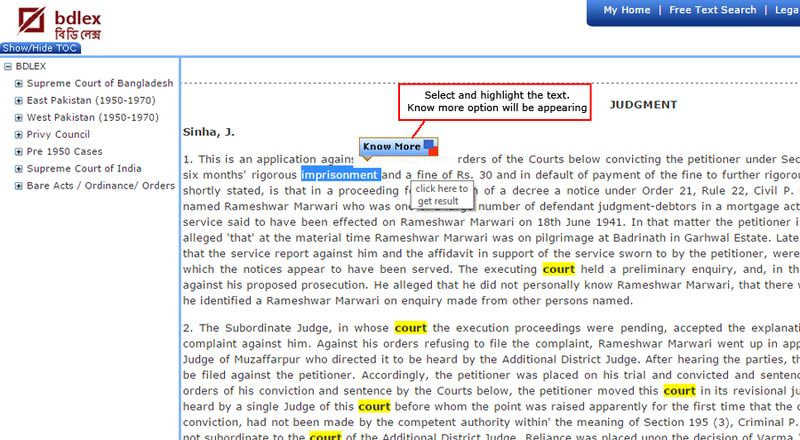 Users can now mark comments, add a note as well as highlight any portion of text while reading the judgement, as per their personal requirement, for future reference. Open any judgement and click on the “Sticky Note” below “Sign Off” as shown below . 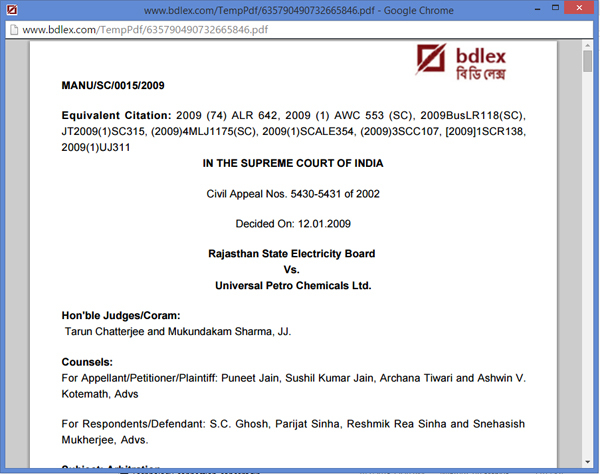 You will notice sticky note control panel appearing on the right of the judgement. To start highlighting any text, select the pen-pad icon from the top options as shown here & select the text in the judgment. Using the tool bar you can select the colour/style for your highlighted text portion. User have an option of Bold, Italic and underline. They can also change the font type. Then right click on the icon and select “Add Note” option to get a panel on which you can start writing your notes/comments, as shown below. To save the comment, click close button. You will notice your saved note appearing on the right hand side panel under the comment’s list. 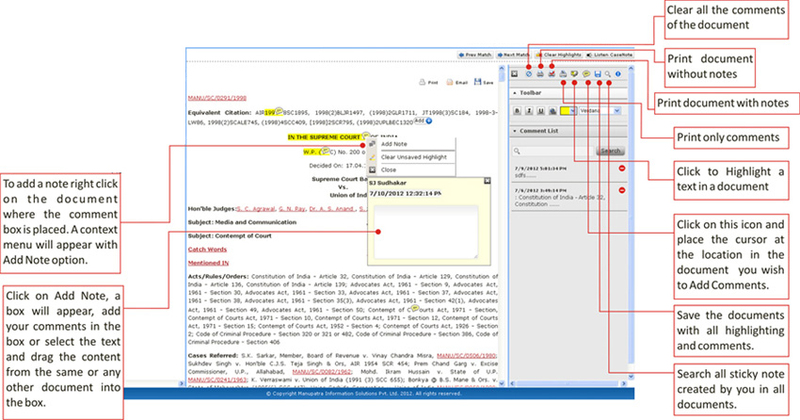 This feature gives the user the option to search for meaning of words/phrases appearing in the documents from the web. Select and highlight the word/phrases you want to search on the web. A Know more option will be appearing, click on the tab to see the results from WikiPedia, Bing and Dictionary. It is important to Sign Off when you leave the site. If for some reason, you do not sign off while leaving the site, you will not be able to Sign in for 10 minutes since your session remains active. Wildcards If you are sure about the complete spelling of a keyword that you are looking for then we can also make use of wildcards. Valid wildcard characters are ‘*’ Matches any characters, any number of times *city will match city, capacity, complexity, specificity..